Netherbury first opened its gardens to visitors in 1963 and hopes to continue for many years to come. We have an amazing variety of gardens to view, including some that open for the NGS. 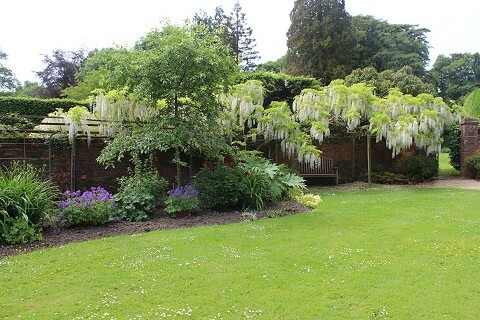 Slape Manor is one, a large garden with sweeping lawns, wonderful trees and flowering shrubs. In contrast is 2 Pye's Plot - a small courtyard garden filled to the brim with interesting plants. Between these sizes there are many other gardens scattered through the village and on the surrounding hills, providing a wealth of different styles. There really is a garden for everyone. The village prides itself on the quality of the home-made lunches served in the Village Hall; teas and cream teas are to be found in four locations to refresh our visitors. There will also be an amazingly generous tombola. Proceeds go to our church and other local charities. £7.50, valid for both days, accompanied under 13s free. Passes available in the free car park, Village Hall and from any open garden. Netherbury is south of Beaminster between the A3066 and B3162 and signed from both.